KANSAS CITY, Mo. -- Travis Kelce likes to watch video of great NFL tight ends, past and present, to see what he might learn from their games. He has seen much of Tony Gonzalez, his predecessor as a great tight end for the Kansas City Chiefs. And, yes, he has watched plenty of the contemporary tight end with whom he has often compared, Rob Gronkowski of the New England Patriots. Kelce said he doesn't see the similarities, other than both are moved around the formation as their respective coaches search for the best matchups for 260-pound players who are difficult to cover. Travis Kelce entered the league in 2013, and since then he and Rob Gronkowski have been prolific pass-catchers. Here's how they rank since that season among tight ends, according to ESPN Stats & Info. "When I get the ball in my hands I'm a different type of athlete," Kelce said in 2017 on the Dan Patrick radio show. "Gronk's going to run around there like a Clydesdale, run through everything, like a big boulder. I'm more a guy who can make people miss, break somebody down with a juke move or slide off tackles. Gronk can just break everything." The two tight ends, who are known for having a good time off the field as well as on it, meet on Sunday night when the Chiefs travel to New England. According to Gronkowski, they've "just met real quick before" and "don't know each other," but there is mutual admiration. 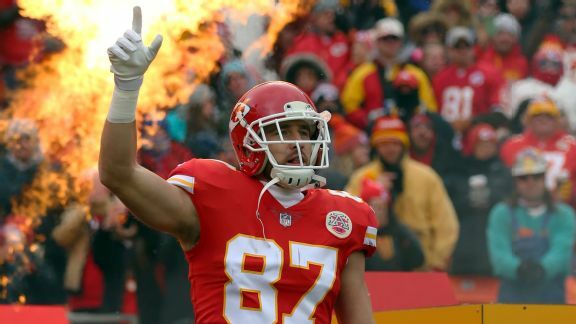 "Definitely have to appreciate him," Gronkowski said of Kelce during Monday's Sirius XM NFL Radio interview with Bruce Murray and Brady Quinn. "He is a great talent, and he can get some good separation and run some good routes. He's definitely a player to look at; just the way he runs and gets open is awesome. So it's going to be a good challenge when we play him this Sunday." Kelce is looking to continue his regular-season success against Gronk in the prime-time game. His Chiefs teams are 2-0 against New England in the regular season and Kelce has 13 catches with one touchdown. But Gronkowski has the playoffs won. The Patriots beat Kelce and the Chiefs in the 2015 playoffs and Gronkowski has been part of two Super Bowl-winning teams. For the 5-0 Chiefs and their high-flying offense, this season may be their best chance to get to a Super Bowl since Kelce arrived as a third-round draft pick in 2013. "I've been fortunate to keep coming back to this place," Kelce said. "This is Year 6 for me so I must be doing something right. It's cool to hear and see some of the younger guys come to me with questions and hearing that my opinion does matter to them. There's that aspect, to try and help the guys that are younger get acclimated into the NFL, but then at the same time we haven't reached the goal that we've set for ourselves to get to the Super Bowl and win that thing. I'm not trying to stop bettering myself so that I give my team the best chance to win whenever I'm on the field." Kelce has learned how to focus his passion in the right way, but it wasn't always like that. Earlier in his career he was penalized several times for unsportsmanlike conduct or taunting. In 2016, he was thrown out of a close game against the Jacksonville Jaguars for picking up an official's penalty flag, one that had been thrown against Kelce for arguing a no-call on an opponent, back at him. But he hasn't had a penalty like that since Week 2 of last season. "He's highly, highly competitive," Chiefs coach Andy Reid said. "He has that personality. It's a good thing, but it can be a bad thing. He has that 'We're playing in the backyard and I'm going to rip your heart out' mentality -- on every play. You've got to control that or you're going to get thrown out of the game. That's just how it works. He's learning how to do that. It's not been an easy thing for him but he's learning. That doesn't mean he's not going to be excited or upset out there. He's a guy that wants the ball every play. That's OK. How you handle that [is important]. There's only one ball. "That's a good thing. I love that. The guys that when you call a play and they're kind of hiding somewhere, you don't want that as a coach. You want them all standing there going, 'Hey, I want to make a play.'" Kelce wouldn't promise such behavior is all behind him. "My passion for this game is never going to change," he said. "You're always going to see me have that fieriness to me. That's just the only way I know how to play this game and I love it for that because I get to release that energy and that passion, that anger that I have. It's something I'm going to have to keep learning with it and keep growing with it, but I think it's a little more under control than it was in the beginning." New England Patriots reporter Mike Reiss contributed to this report.